make it perfect: .Dear Maya. Thankyou for the lovely puzzles you sent Oscar and Uncle Jaron in the mail. They really love them and are doing the hardest one right now. 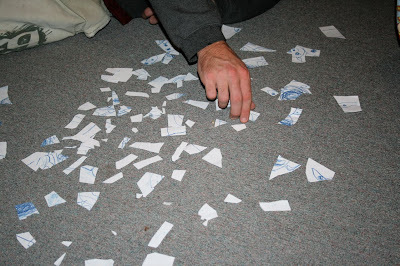 You are very good at drawing pictures then cutting them up into little pieces to make puzzles. You should make some more. 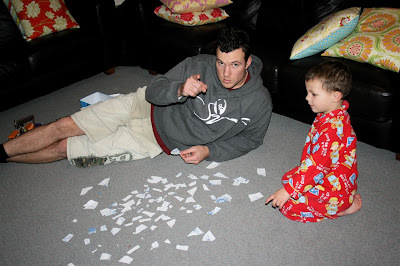 Uncle Jaron says the puzzle is really, really hard. He has been trying to put it together for about 1 hour so far. He heard rumour that your Dad said $500 was up for grabs if it could be put together. Uncle Jaron really wants $500. That is why he is doing your puzzle on a Friday night. P.S. Oscar said could you tell Mason thankyou for the AWESOME dragon pictures? Mason is very good at drawing too. Um, was Jaron trying to tell you not to take a pic? I see him pointing at the camera. That is hilarious! I'll laugh even harder if you tell us that the $500 is only up for grabs because the last piece is missing! lol! That is awesome - I hope he sticks with it and gets the $500! I can remember doing that with my sister... chopping up a drawing and giving it to her as a puzzle. hee hee - that made me laugh! If Jaron can finish it can he send it round our way. $500 is pretty good motivation!